What is a Georgia Eviction Notice? Georgia Eviction Notice: What Is It? A Georgia eviction notice is legal notice provided by the landlord or the property management company to the tenant if the tenant violates the lease in some way. An eviction notice must be legally served upon the tenant before the landlord may file a Dispossessory Affidavit to begin the eviction process through the court. A Georgia eviction notice is also known as a notice to quit. All Georgia eviction notices must comply with landlord-tenant law in the state. An eviction notice is often referred to as a notice to quit. What Are the Components of a Georgia Eviction Notice? The legal name of the tenant or tenants who signed the lease. The person or persons who signed the lease are legally obligated to abide by the terms of the lease. The location of the rental property. This is the full address, including city, zip code, and county. The date that lease was signed by the tenant(s). 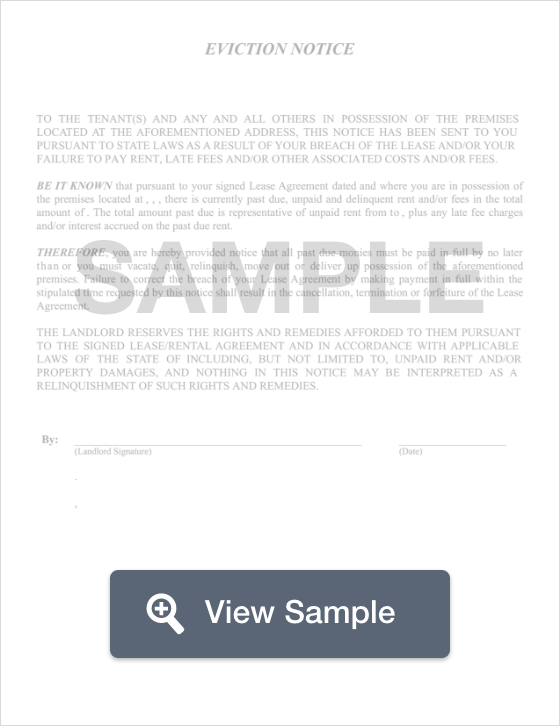 Landlords or property management companies may find it helpful to include a copy (not the original) of the signed lease agreement. The eviction notice must be signed by the landlord or an agent from the property management company. A completed certificate of service that includes the date the eviction notice was served, to whom it was served, how it was served, and the signature of the individual who served the Georgia eviction notice. One of the most common Georgia eviction notices is known as an Immediate Day Notice to Quit for Non-Payment of Rent. This eviction notice must comply with § 44-7-50. In Georgia, the landlord is not required to send out this notice if the tenant doesn’t pay rent. It is sent as a courtesy. The notice informs the tenant that they are behind on rent and must pay what is owed immediately or the landlord may immediately begin the legal eviction process through the court. If this notice is used, it should include the amount of rent that is past due and the date by which it must be paid. There is no state statute that requires landlords to give past due tenants a certain number of days to catch up their rent. For service, the landlord may have the tenant personally served, serve a member of the household or an employee at the tenant’s place of business if they are of suitable age, through the mail, or it can be posted on the front door of the property. A 60-day month-to-month notice to quit isn’t technically an eviction notice. However, it plays a similar role because it informs the tenant that the landlord does not plan to renew the lease and requests that the tenant vacates the property. Under §47-7-7, landlords must give the tenant 60 days to end a month-to-month tenancy and the tenant must give the landlord 30 days’ notice. This notice should include the date by which the tenant should vacate the property. Landlords are not required by landlord-tenant law to give any notice to tenants before evicting them for non-compliance of the lease. However, landlords are generally encouraged to inform tenants of an issue of non-compliance so that it may be corrected and the property may continue to be occupied. Unless the violation is serious, the landlord may want to consider the long-term cost associated with a vacant property. What Are the Legal Considerations of a Georgia Eviction Notice? Unlike most other states in the US, Georgia has some lax laws related to eviction. Landlords are not legally required to provide tenants with a certain number of days of notice to correct non-payment of rent or a violation of the lease. For both, landlords can start the eviction process through the course immediately. With that said, not all evictions are legal. Illegal evictions happen if the landlord wants to evict the tenant for reporting code violations related to the property (known as retaliatory eviction), if the landlord wants to evict the tenant for discriminatory reasons, or if the tenant wants to use “self-help” methods instead of going through the court. Self-help means the landlord changes the locks, shuts off the utilities, or removes the tenant’s property from the rental unit without a court order. If you are sued for eviction or if you receive an eviction notice from your landlord, make sure that you have documentation. Also, you should talk with a lawyer, legal clinic, or legal aid office to determine whether the eviction was legal. If the eviction was illegal, you may have the right to sue the landlord. Georgia evictions are different than in most other states. Landlords aren’t required to provide a written eviction notice that provides a certain amount of notice to the tenant. To learn more about evictions, make sure that you talk with a Georgia landlord-tenant lawyer.